A brief perusal of events in 1958 signifies how the world has evolved over the last half-a-century. Sergei Khrushchev and Charles de Gaulle assumed the premierships of their respective nations; the USS Nautilus became the first vessel to cross the North Pole submerged; the UK witnessed the installation of its first parking metres; and The Bridge on the River Kwai won the Academy Award for Best Picture. 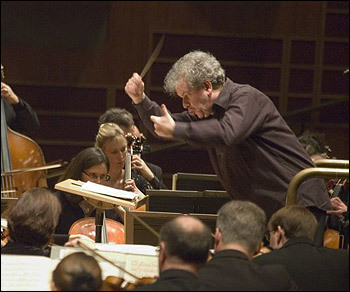 Yesterday evening, however, the Proms organisers transcended the last fifty years by reincarnating a magnificent programme – originally given on 3 September, 1958 by Basil Cameron's London Philharmonic Orchestra – that consisted of Mendelssohn's Ruy Blas overture and 'Italian' Symphony, and Brahms' Second Piano Concerto and Second Symphony. Making their first Proms reappearance after a triumphant display on Opening Night, Jiři Bĕlohlávek and the BBC Symphony Orchestra began procedures with a rousing account of Mendelssohn's last overture (Op. 95), the solemn, intermittent brass fanfares elegantly offsetting the otherwise nervous energy that the piece exudes. Some lovely touches were to be heard here, most notably the expansive 'cello, clarinet and bassoon melody in which the strings began as the dominant force before allowing the woodwind into the foreground. Mendelssohn's ebullient Fourth Symphony in A major, Op. 83 was no less successful, characterised throughout by woodwind playing of an extraordinary calibre, from the sincerity of their countermelodies in the melancholic Andante con moto to their perkiness in the brisk opening chords of the first movement. The strings struggled to match this captivatingly taut rhythmic impetus at first, though they quickly cottoned on and produced some particularly fine playing in the final Saltorello. Here, the intrepid rapidity set by Bĕlohlávek occasionally threatened to spill over without ever actually doing so, something that served to enhance the vibrant fervour of the work. The diminutive brass section also played its role to perfection, with especially charming contributions in the third-movement Con moto moderato. Whereas Cameron and the LPO in 1958 had to manage without the luxury of an intermission before Brahms' epic Piano Concerto No. 2 in B-flat major, Op. 83, on this occasion an interval facilitated the logistical nuisance of rearranging a symphony orchestra around a concert grand. 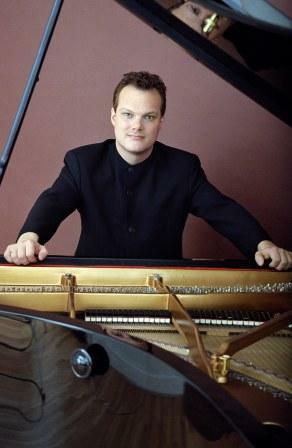 German pianist Lars Vogt was the soloist, delivering a performance that favoured poeticism over blazoning virtuosity (though this should by no means be read as a criticism of his assured and riveting technique). Though the opening movement didn't wholly convince, the ensuing Allegro appassionato was outstanding, with suitably ardent orchestral playing and Vogt's beautifully sustained cantabile in the Trio section. The latter was also apparent in his duet with BBCSO principal cellist Susan Monks in the Andante, whilst both pianistic and orchestral dexterity was on vivid display in the finale. Bĕlohlávek's direction was exemplary, conveying superb unity with Vogt and achieving seamless, near-otherworldly returns to the principal themes of both the first and third movements. A second interval saw the piano make its exit in readiness for Brahms' D-major Symphony, Op. 73. Conducting from memory, Bĕlohlávek generated a wonderfully balanced performance, allowing for moments of reflection without letting the music become too pensive. There was never a hint of wallowing in the tempo of the first movement, which came across as a single, lucid stroke of the composer's pen (marred on one or two occasions by some oddly unattractive sounds emanating from one of the horns). The central Adagio non troppo and Allegretto grazioso embodied the descriptive elements of these performance directions in every respect, the woodwind reminding us in the latter of their vivacious acrobatics in the Mendelssohn symphony. Barely containable pent up energy gave way to a breathtaking burst of exuberance in the closing Allegro con spirito, with luminous brilliance from the brass bringing the work and the concert to a resounding conclusion. In this rich vein of form, I for one am eagerly anticipating this conductor's performance of Verdi's Requiem at the end of August. Perhaps it is appropriate, however, to conclude by paying a final tribute to Basil Cameron and his LPO. After their one-interval performance of this mammoth programme in 1958 they returned the following night for a concert that included nothing less than a Handel overture (arranged by Elgar), extracts from Berlioz's The Trojans, Rachmaninov's Fourth Piano Concerto, Franck's D minor Symphony, Rubbra's Soliloquy and Ravel's Boléro. Quite a display of fortitude, by any standards! Different point of view? Visit our Facebook group or blog and have your say.